This advanced picture-in-picture processor provides users with a cost-effective solution of combining all or selected video inputs together into different style of split-screen views for one screen display. This PIP unit supports total of 8 standard video/audio inputs with 2 composite video outputs and 1 audio output. All video and audio inputs will be synchronized accurately so all camera feeds or other composite video feeds can be output simultaneously for smooth and sharp pictures without any glitch occurred. 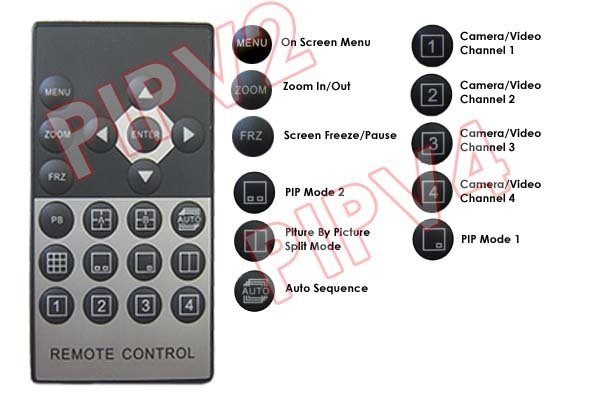 This screen video processor provides user with various screen mode options such as the common quad screen mode and various PIP screen modes for viewing additional video feeds on the main screen. It has more features and options than all other models on the market. 2 composite BNC/RCA video outputs are available for displaying on two video monitors, or one for a monitor with the other for a surveillance VCR or DVR. There is also a VCR input port for connection with a surveillance VCR recorder to playback recorded video. Users can easily switch between live viewing and playback of the recording from VCR/DVR connection. This 8-channel quad PIP video processor supports audio inputs and output. There are total of 4 audio inputs in 3.5mm headphone style so each video input has its audio input channel to be associated with. User can press the "VCR/ENTER" button on the front panel to toggle through all the audio input channels connected and select the desired audio input for output to TV or video monitor, external speakers or DVR for audio monitoring or recording purpose. This 8-channel quad video mixer system adopts the advanced motion detection on all channels. Great feature for all video monitoring and security surveillance applications. Supreme 8-channel video mixer solution designed for visual applications that require multiple video feeds to be displayed one one same screen. Great tool for visual applications related with video monitoring, multimedia presentation, editing/post production or video capturing. Combine all or selected input video feeds into different split-screen styles on one display for preview, live monitoring or recording. 8 standard video inputs with 4 audio inputs. 2 standard video outputs with one main audio output. Users can select any of the video/audio inputs connected for output to a TV monitor, external speakers or DVR for monitoring or recording purpose. Easy fast switching between video/audio inputs, split-screen modes and others by using IR remote or push buttons on the front panel. Supports total 18 screen modes including 8-channel split, quad screen, 3-channel splits, 3-PIP modes, 2-channel splits, 2-PIP modes, 1-PIP modes and single channel full-screen. Image freeze control, enabling video frames to be paused or captured for extended period of time. Zoom function from quad to full screen picture.